Refugees have grabbed headlines over the past year, but the world has especially focused on Syrians running from the increasingly complex turmoil gripping their homeland. How many complete the dangerous journey alive? The statistics are grim. But other crises involving refugees and displaced people continue to fester, their plight falling under the media radar due to the evolving and immediate nature of breaking news. If it bleeds, it leads. But if it’s been bleeding a long time, it’s comatose. With crisis overload, where do we turn our attention when everything feels dire? 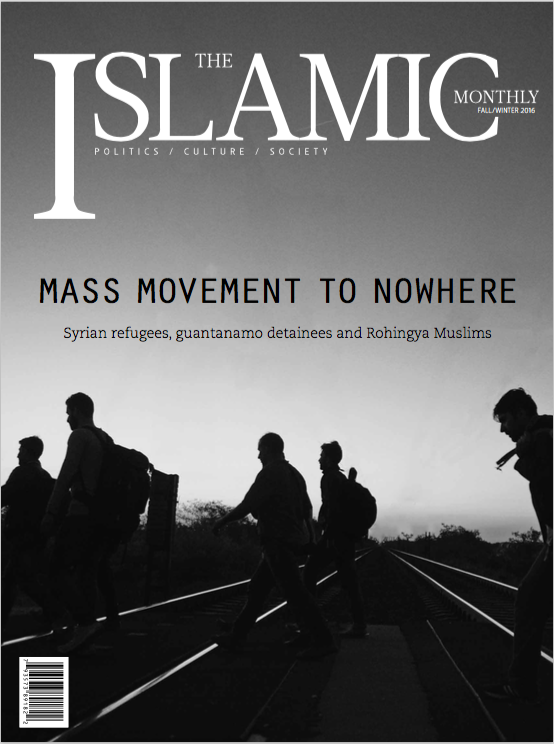 In this issue, we examine the refugee issue from a number of perspectives, including the brighter side of hope, with some solutions to the constant doom and gloom parading in the headlines. Souheila Al-Jadda examines the importance of the U.S. taking the lead in resettling Syrian refugees, using California as a case example of how we should proceed. Across the border in Canada, Muneeb Siddiqui looks at how its refugee policy has evolved and the hope placed in Justin Trudeau’s new government. Taylor Barnes goes to Uruguay and explores how the country that’s always done things off the beaten track has taken in not only Syrian refugees, but also former Guantánamo Bay detainees, and the successes and pitfalls that came along with this experiment in hospitality. Jonathan Rashad follows a group of Syrian refugees in Austria and Hungary and shines a photographic light on how the people seeking safety come from all walks of life, from all parts of Syria, each with his/her own unique hope for the future. Christopher Jackson paints a picture of the unique place that art holds in a world of upheaval, how art and the refugee crisis affect one another. He also catches up with Joel Bergner, a muralist who led projects at the Za’atari refugee camp in Jordan, home to many Syrian refugees. Amarnath Amarasingam talks to a man who has opened a series of informal schools in mostly rebel-controlled areas of Syria, providing education to more than 10,000 students. Laila Alawa examines the unique role that women play in the Syrian crisis. Syria is not the only refugee crisis on our radar. Adem Carroll and Azeem Ibrahim highlight the underreported issue of the persecuted Rohingya minority in Myanmar. Adem looks at five people who have dedicated their lives in bringing attention to widespread atrocities against this minority as well as helping those who do make it to the U.S. as refugees. Azeem explains why the extermination of the Rohingya is rapidly on track to becoming the next genocide of our times. Michael Vicente Perez examines another refugee crisis that has fallen off most radars: the double displacement of Palestinians, first from their homeland after WWII, and now from Syria. We also explore Islamophobia, cases of which have increased exponentially in the U.S. and worldwide since 9/11. Some may say we live in an increasingly paranoid world, where each attack by ISIS or other radical groups affects and erodes the West’s relationship with Muslims. Ibrahim Al-Marashi takes issue with the current scholarship on ISIS and highlights 10 dimensions to the group that often go overlooked. Linda Wertheimer has written a book on how courses on religion in primary and secondary schools can help teach young people respect, not fear, of other faiths. Benjamin Orbach introduces America’s Unofficial Ambassadors, a citizen diplomacy initiative aimed at increasing the number of Americans who volunteer in areas of human development worldwide. Murtaza Hussein emphasizes the importance for Muslims to look at the Black experience in America to survive and thrive as a community the coming years, and incorporate more Black Muslims into their leaderships. Catherine Osborn goes to Brazil and examines the problem of Islamophobia there. Rabbi Jonathan Sacks, author of Not in God’s Name, talks about how important it is that faith traditions offer an alternative to the violent voices within each. Steven Zhou makes the argument that the attacks in Paris and San Bernardino were not due simply to religious conservatism, but rather necessitates a number of factors in addition to continuous exposure to extremist messages and propaganda. In other news, Wafa Unus talks about what happens when science and journalism collide before going their own ways. Amanda Figueras interviews a single woman in Dubai who is breaking cultural barriers by adopting children, and is blazing a trail in encouraging more people to consider adoption. Spearit explores Muslims’ influence on the world of hip-hop and its themes of incarceration. Shabana Mir explains the importance of minorities having their own unique space in which to investigate more complex issues. Haroon Moghul ruminates on Muslims’ historical journey in Spain, and offers a poem written from the perspective of a survivor. Aina Khan reflects on the experience of the diaspora community and their descendants, and how their heritage is always present in their daily lives. Purchase a single issue with print on demand here. The Nobility of Leadership: The Life & Struggles of Rohingya Refugees in the U.S.